With the explosion of mobile devices there is little doubt that the number of security incidents were a mobile device is involved will also increase exponentially. My next couple of posts will look at what is takes to perform forensics on mobile devices targeting specifically the iPhone, the Blackberry and the Android platforms. Some interesting statistics on the iPhone in particular and the number of them that AT&T activated in the last couple of years. 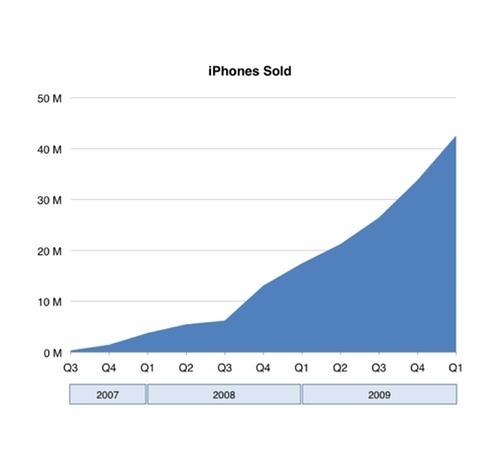 As can be seen below the number of iPhones activated in the 3rd quarter 2009 was 3.2 millions devices in the US alone. This doesn’t equate to iPhone’s sold because activations would also count dad’s giving their iPhone to their daughter and buying a new one for themselves, which would mean 2 activations but just one iPhone bought. According to AT&T they added 2 million subscribers to that quarter. Nevertheless the evidence is there on an upward trend. 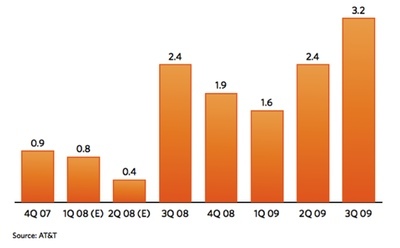 The graph below shows the how activations for the 1st quarter of 2010 rose by 50% over the previous quarter. As professionals in security we are constantly researching new technologies to keep our skills sharp. The Internet Storm Center was formed to assist with keeping our peers aware of the fast paced changes in vulnerabilities, patches, hacks, worms, Trojans and threats in general. How we communicate these risks to our key decision makers sometimes can be a challenge. A recent example would be the Conficker April 1st situation. It was important for us to convey the sense of urgency we felt to have MS08-067 patched, as well as cross checking all our systems for updates being rejected, anti-virus definitions up-to-date and so on. My question to you is “did you communicate the risk effectively”? Were you able to give a complete and accurate risk assessment to your management? Remember that risk assessment is the process of identifying a threat, understanding how that threat relates (vulnerability) to your organization, assessing the cost and providing that information to management. The formula is simple, let’s break it down. State the threat in language that is easily understood. It is your job to decrypt the threat for your management team. Portray clearly and accurately what the threat could do and how it would possibly perform in your environment. Identify the corrective measures which are available to be taken. Calculate the SLE (Single Loss Expectancy). What is the dollar value of the cost that equals the total cost of the risk? State how the remediation would lower the exposure to the organization and give a cost for those actions. Recalculate the SLE with projected remediation included. Provide status of the protection mechanisms already in place (anti-virus definitions, IPS signature detections, patching statistics). Then allow management to make an educated decision based on risk to the enterprise, not just the security event itself. By utilizing this concrete methodology, we can lessen the influence of media hype and provide a professional cost based opinion to those best equipped to make enterprise decisions.